Guns of Icarus Alliance is a game that has its roots in Guns of Icarus Online, which saw partial funding with a Kickstarter to gauge interest in a game of this type. Developer Muse Games has been hard at work porting their airship battlefest to the PlayStation 4, and we have our review ready for you below. The world of Guns of Icarus has a steampunk theme, one where aircraft as we know them today never really came about, and the most advanced form of flying came by means of airships. Take a Zeppelin and attach a battleship to its underside, and you have the basic idea down. Ships have two or more guns, engines on both port and starboard sides, and an engine. 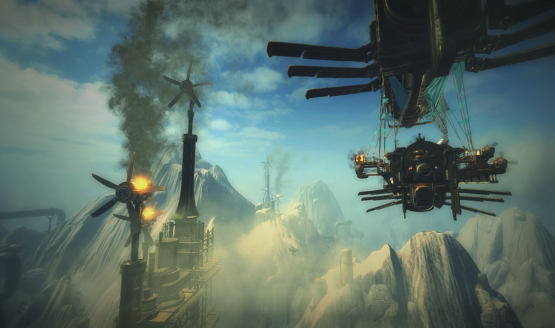 The Unity Engine powers Guns of Icarus Alliance. Performance is suitable for a game of this scale, though the frame rate can dip noticeably in intense firefights. There are no apparent upgrades for those playing on the PlayStation 4 Pro, though an option is available to turn vertical sync on or off for those who hate to see screen tearing. Graphically, Guns of Icarus Alliance is good enough to get the point across that players are on what amounts to a wooden ship floating in the sky, but it feels a little rough around the edges. Guns of Icarus Alliance is a first-person shooter, though the option is also available to play in third-person. Teams of up to four players work together to keep their airship afloat. Despite their being four players per crew, there are only three classes of characters. The pilot steers the ship, and can command other players with what needs to be done. The engineer handles repairing the many parts and weapons aboard a ship. The gunner is best suited for manning the guns on the airship. While any player can take on any role at any point in a match, each class has special abilities which help their role, and while every character can carry one item that relates to each role, they can carry more items relating to their chosen class, thus incentivizing the player to stay within that chosen role as much as possible. Gameplay is relatively simple, too. Guns of Icarus Alliance is a first-person shooter, where enemies are shot at from a distance. Sometimes this distance is small, but often players are shooting at waypoints marked by the pilot or other players, at targets dozens or hundreds of meters away. Pilots, who serve as captains, have perhaps the most complex job on board, as they must navigate their airships in all three dimensions, and must also consider where weapons are placed on their airships in order to attack enemies in the most efficient manner. Gunners simply have to keep the assault coming, occasionally switching sides of the airship as the situation dictates, while engineers must frantically run back and forth between airship parts in order to repair them. If a part’s health drops to zero, it must be restored, which naturally takes quite some time. These three roles complement each other nicely, and yet more roles would have been appreciated. Players can level up each of their three classes, to unlock new abilities and outfits for that class. Gunners, for instance, can use various types of special ammunition, which can have a higher chance of catching opposing enemies’ airship parts on fire. Engineers can combat this with upgrades of their own, such as a special spray to use on parts which can pre-emptively give them resistance to catching fire for a half-minute after being sprayed. Meanwhile, pilots can use moonshine for speed boosts to the airships, though they are advised to alert their engineers that they are about to use it, since it damages the engines! There are six factions for players to choose from. Seasons of gameplay pit all of the factions against one another, in a meta game that can last for months. Factions possess airships with certain abilities, such as heavy firepower with short range, or lighter firepower with longer range. In-game currency can be earned via playing matches, and then spent to help the faction the player is aligned with, or in an attempt to undermine an opposing faction’s chances at success. Wars can take place in various locations on a map, much like a board game whereby the battles take place in-game, and the results of which are posted for all to see. Cross-platform play is a very rare thing to find, at least in the world of PlayStation. Yet somehow developer Muse Games has pulled it off. Not only can PS4 and PC gamers play in the same crew together, they can also use voice chat to communicate strategy. Voices sound crystal-clear, to boot, and a large percentage of Guns of Icarus Alliance’s population have headsets equipped. Players’ platform of choice is shown next to their name, and other than that it is difficult to tell who is playing on what, which is a good sign. Other than some tutorial missions, Guns of Icarus Alliance is online-focused. As such, a lot of a player’s enjoyment, or lack thereof, will be dictated by those with whom the game is played. While each role’s gameplay may be simple, combining these roles efficiently in the heat of battle is no easy feat, and a highly cohesive team composed of friends will usually come out on top over the team that is formed by random players. Also, it seems the player count is already dipping under 1,000. Despite this, however, getting into a game is a fairly quick matter of waiting in the lobby for no more than a few minutes, since those who are playing appear to be actively wanting to play, and not just sitting in the menus. It remains to be seen if this will be the case for much longer, though, as the player base inevitably ticks downward while wait times shift upward. Guns of Icarus Alliance will appeal to those who love working on teams. A good selection of ammunition and ability modifiers can help to craft a personalized loadout, even if the class selection of players feels limited. While the presentation is a bit generic, it will please steampunk fans. A metagame that runs constantly helps to make even a small match feel like part of something bigger. Still, a small selection of character classes makes one wonder what else could be done with the fantastic idea of battleships in the air, and an already small player population might mean there won’t be many battles in just a few months’ time. At just $14.99 USD, however, Guns of Icarus Alliance is recommended for those who want a different kind of co-op experience. Guns of Icarus Alliance review code provided by publisher. Version 1.04 reviewed on a PS4 Pro. For more information on scoring please see our Review Policy here.